When Jo steps onto Tau Ceti E, it should be the happiest moment of her life. After all, she’s been training for as long as she can remember to be a cadet pilot in the International Space Agency. She’s dreamed of the day she and her family would leave Earth forever and begin life as pioneers on a new planet. But now she can’t stop thinking of everything that has gone wrong on their mission: the terrible accident that nearly destroyed their craft, that set their voyage back years, that killed her brother, that left her unable to fly… As Jo struggles to live with her grief and figure out who she’s going to be now, she falls in love with her new world. It isn’t hard. Jo’s team is camped out by a pristine, tumbling river at the base of a mountain range that looks like huge prisms buried in the prairie. The soring crystal peaks transform every sunset into rainbows full of colors human eyes have never seen before. And that’s just the beginning. Tau offers Jo and her family a lifetime of beauty and adventure. Jo throws herself into helping her team, lead by her commander mother, establish their community on this amazing new world. But just when she starts to feel like her old self again, she uncovers a devastating secret her mother has been keeping from her people. A secret that could destroy her family’s pioneering dreams…if they survive that long. With the fate of the pioneers in her hands, Jo must decide how far she’s willing to go to expose the truth — before the truth destroys them all. Thank you so much Bridget for sending me an ARC to review and for answering our interview questions! 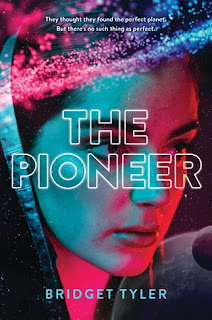 I've been interested in The Pioneer since the moment I read the synopsis and saw the cover when HarperTeen had revealed their winter 2019 books. I'm a sucker for anything space exploration and having to do with aliens. The Pioneer was right up my alley. The Pioneer was brilliant and different, Tyler created a planet and alien species that came alive right in front of me. Earth is dying and their only hope is a the planet Tau Ceti E that is light years away. The Watson family has sacrificed a lot in the journey to make this beautiful planet their new home. After a horrible accident that left Jo horribly injured, her brother Teddy dead and their ship nearly destroyed and the trip to Tau pushed off several more years. Jo can't help but think of everything that has gone wrong. But it's a dream come true when they finally touch down on Tau and begin building a new life for themselves along with the rest of the E&P team. But shortly after arriving Jo uncovers secrets that have been hidden by the ISA (International Space Agency) and her own mother, the commander of this mission. Full of adventure, a swoon worthy romance and nonstop action The Pioneer swept me off my feet from the very first page. I really enjoyed Jo's character. In the prologue she is still a cadet and living her dream of being the pilot that would bring the ship down to Tau. But within those few pages we see that ripped away from her. After the accident that killed her brother, Jo suffered damage to her heart requiring the assistance of little nanites to keep her alive. Her dream of flying was gone, the change in altitudes would cause her to pass out. We see Jo go through the aftermath of that to finding ways to be helpful on the settlement since now she is just considered a civilian. Tyler's world building was amazing. Tau Ceti E came a live right in front of my eyes. The vibrant vegetation, the overall development of the land and technology, I had a clear image of this planet and its wild life. I knew this book was going to include aliens, but imagine my surprise when there were two alien species living on Tau (well, they belong there. So, that would make humans the aliens.) Bringing the two alien species to life with their differences, their ways of communicating and appearances as well as both being intelligent species was amazing. In YA we often read books where aliens are invading earth, but this is a book with humans are invading another planet. It brought a lot of things into question for Jo and the rest of the gang. I loved the romance aspect in this book. I am a sucker for swoon worthy boys with smooth lines and that is exactly what Tyler included in The Pioneer. I am really excited to see more of Jay in the next novel and where his and Jo's new relationship is going to go. Overall I really loved The Pioneer and I can't wait to see what Tyler has in store for us all next. Also, this just may be me but I would love to see The Pioneer as a movie, I think it would be amazing!